WHILE the good old a�?vanishing coina�� trick could hold our attention in the past, today the ante has been raised and magic is sublime. 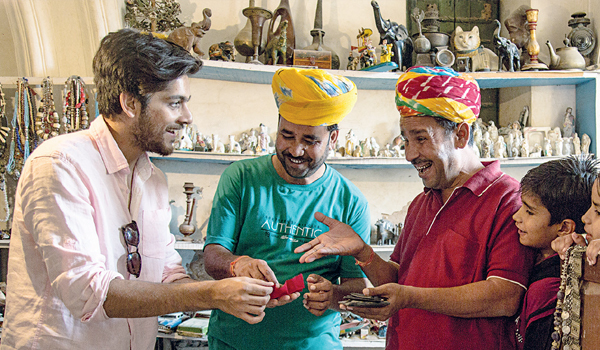 At least, that is how it is in You Got Magic, NDTV Good Timesa�� travelling show, which returned this week in its third season with Neel Madhav as its host. a�?Magicians are passea��of the old abracadabra, rabbit out of the hat birthday party kinds. I am a mentalist, as I completely rely on theories of criminal psychology and neuro linguistic programming,a�? begins the 23-year-old, who will travel through Rishikesh, Mandawa, Kochi and Ranthambore to enthrall commoners with his tricks. In one of the episodes, Madhav teleports himself from a roof top to another, makes gold dust out of sand, and hypnotises an individual, temporarily erasing his ability to read. He also transforms a leaf into a butterfly on camera, and reads peoplea��s minds with a classic card tricka��which is based on Madhava��s observation of peoplea��s toes. a�?I am supportive of the revelation of secrets behind a magic trick. Magicians cannot ride on the same magic tricks forever and need to innovate on a regular basis,a�? adds the youngster, who also trains businessmen and corporates on the art of reading peoplea��s minds in negotiations. A self-taught magician, Madhav developed an interest in illusionist acts after meet ing world-renowned American mentalist, Jason Randal, when he was just 16. Another illusionist whom he looks up to is James Randi, the debunker known for shattering Harry Houdinia��s underwater record. a�?If you want to pursue magic, start with the 1948 book, The Royal Road to Card Magic, by Jean Hugard. It is popular for developing the bullet catch illusion,a�? adds Madhav, who released his debut book, You Got Magic, last month. a�?When it comes to entertainment, we are fixated on movies, songs and dance sequences. Magic is a billion-dollar industry that we are missing out on in our country. We dona��t have a single notable magician in our country after PC Sorcar and this is saddening. After all, we are the land of the great Indian rope trick,a�? concludes Madhav. You Got Magic airs tonight, at 8.30 pm, on NDTVA�Good Times.